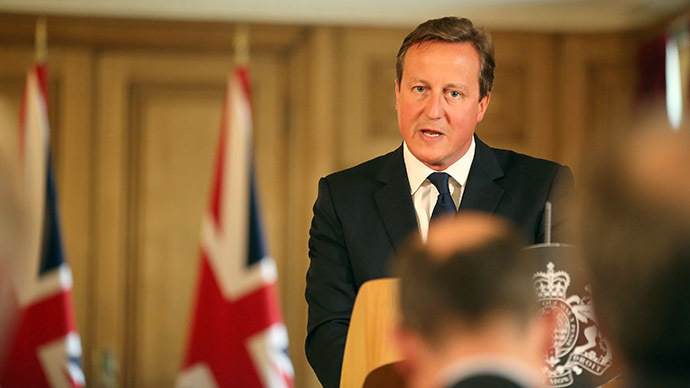 ISIS poses a “greater and deeper threat to our security than we’ve seen before” said Prime Minister David Cameron. His statement follows a decision to raise the UK's terror threat level from "substantial" to "severe" over events in Iraq and Syria. He stressed a distinction must be made between the Islamic faith and extremist political ideology, which he said must be defeated at its root. The Prime Minister explained he would be making a statement in parliament on Monday detailing measures to remove the citizenship of those who travel to fight with the Islamic State. He said there are “gaps in our armory” that would need to be filled with new legislation “to keep our people safe” and tackle extremism. He said an “intelligent response” was needed combining military, diplomatic and humanitarian aid. He also reiterated his support for US airstrikes. Cameron stressed the need for the UK to work with its allies – by providing intelligence for the US, delivering aid supplies to those in need, supporting a united Iraqi government and arming Kurdish forces who are fighting against IS militants in Iraq. Britain’s terror level threat has been officially raised from “substantial” to “severe”, Home Secretary Theresa May confirmed earlier. May stipulates UK intelligence have not gleaned information pertaining to an imminent attack, but the upgraded alert level indicates a prospective attack is “highly likely”. Britain is thought to be facing an acute risk of such a terror attack in light of ongoing bloodshed and carnage in Iraq and Syria. This threat level is the second most serious the state can announce from a range of five separate levels. The upgraded alert was put in place by the Joint Terrorism Analysis Centre (JTAC) - a subset of Britain’s Security Service (MI5) dedicated to analysing intelligence relating to global terrorism. According to MI5, Britain has not faced such a serious risk of terrorist attacks since 2011. In a public statement, the Home Secretary said that each threat level dictates a multi-pronged state response, informing “security professionals across the public and private sectors as they make decisions about the appropriate level of protection in place across the UK”. JTAC’s judgements are dependent on the most up-to-date intelligence gathered by Britain’s Security Services and are independent of Ministers, according to May. May said on Friday the “increase in the threat level is related to developments in Syria and Iraq where terrorist groups are planning attacks against the West”. “Some of these plots are likely to involve foreign fighters who have travelled there from the UK and Europe to take part in those conflicts”, she added. In an effort to assure the public the UK government is employing the most comprehensive action possible to protect the British populace, May said the government has “already taken steps to amend our powers and increase our capabilities” for dealing with “developing terrorist threats we face”. “That process will continue and the British public should be in no doubt that we will take the strongest possible action to protect our national security”, she added. The Home Secretary insists Britain faces a “real and serious” threat from international terrorists. She has urged the wider public to remain vigilant and to immediately report suspicious activity to the police.